This articles is part of my ongoing series on Desktop Electronic Music (DEM). The landing page provides easy access. If you are anything like the typical DEM practitioner, your desktop is a tangle of cables, interlocking musical devices, power supplies, and patch-cords. How can we tame this mess? Here I will tackle one aspect of the problem, by evaluating portable mixers. UPDATE 16 August 2017: Two additional mixers added, for twelve in total. Some basic terminology will help us in the evaluation. There are essentially three audio signals signals we might encounter in music, but this review will only focus on one. Microphones produce weak signals that require boosting with a mic pre-amp. Pickups like those found on electric guitar require impedance matching through a DI ("Direct Inject") box. There are plenty of compact mixers on the market (from Mackie, Behringer, etc.) that handle these cases. But here I am interested only in line level signals (at a nominal -10 dBV). Most consumer audio equipment, tables, keyboards, drum machines, CD players, etc. use this signal strength. A simple potentiometer will help us balance the levels within this range. No amplifiers or impedance matching are necessary, but they are a nice bonus. Cable and plug terminology is different on each side of the ocean. I will refer to a jack plug, meaning a 6.5mm or quarter-inch plug, typical of instrument cables. Confusingly, this is also called a phone connector. (But not a phono connector. That's different.) Jack plugs may be wired for monophonic signals, using two signal contacts (Tip Sleeve or TS). Or they may be wired for stereo using three contacts (Tip Ring Sleeve or TRS). The second common type of plug is the minijack, AKA eight-inch or 3.5mm. Again these can be mono (TS) or stereo (TRS). There are two main types of mixer circuits. Active mixers require power, and allow you to boost signal strength. This power can come from a DC adaptor plugged into the wall, batteries, or a USB cable connected to a computer (or similar device). Passive mixers do not require power, but instead mix signals using potentiometers only. Since there is resistance in the way of the current, the output will always be less than the input (by 15 to 30 dB). This may be an issue if your devices are not loud enough to begin with. You will need to make up the gain in a later amplification stage, which can introduce noise. To counter this potential disadvantage, passive mixers are inherently more portable. Also, since the circuits have no polarity, inputs and outputs can be reversed. A circuit that combines four inputs to one output is identical to one that splits one signal four ways. OK, it's time to check out what's on the market, starting with those mixers that accept full-sized jack plugs. I will price each unit at Amazon UK (in pounds sterling) and Thomann (in Euro) where possible, using direct manufacturer pricing otherwise. Omnitronic is a brand of the German firm Steinigke Showtechnic, which distributes DI boxes, cable testers, mixers, preamplifiers, and similar devices. 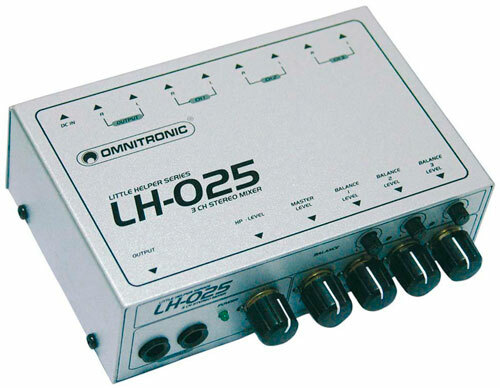 The Omnitronic LH-025 is an active stereo mini mixer in the entertainingly named "Little Helper Series". The LH-025 is unique in this comparison in having three stereo inputs, each configured as a pair of mono jacks. Each stereo pair has a level pot and a smaller balance pot. This too is a distinctive feature. The stereo output is also provided on two mono jacks, with a level pot allowing control over the sum. Additionally, the front panel has two stereo headphone jacks with a single pot controlling both. Price on Amazon is £74, reasonable considering this is the most fully-featured jack mixer in this comparison. 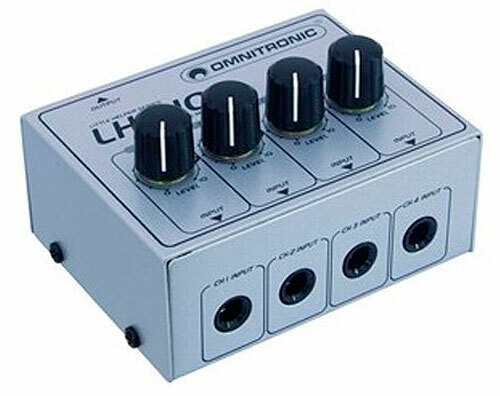 The Omnitronic LH-010 is a passive mixer with 4 mono jack inputs with pots, feeding a single mono jack output. It's simple and to the point. Amazon price is £37. Nady Systems have been making wireless microphones since 1976, since diversifying into other audio components. 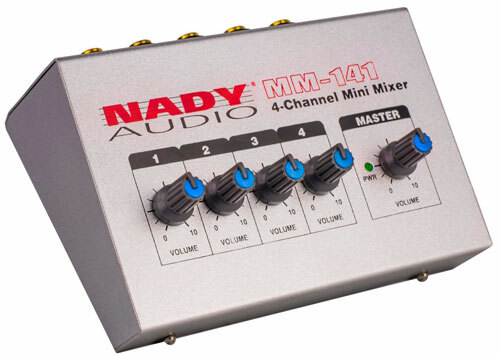 The Nady MM-141 is an active mixer powered from 9V DC power or a 9V battery. It has 4 mono jack inputs, each with level pots providing 20 dB gain. The output is mono jack. Amazon price is £42. The Nady is over-sized compared with the similar Omnitronic LH-010. Though it has a master volume, I debate the usefulness of that on a passive mixer. You are more likely to wish to boost, rather than attenuate, the final signal. Behringer is a German firm infamous for their clones of devices developed by other companies. And they are equally well known for their cheap prices, since they were perhaps the first large audio firm to adopt Chinese manufacturing. 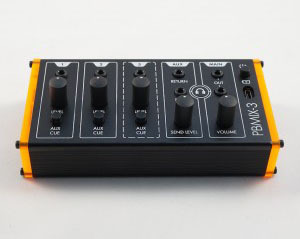 Their MicroMIX MX400 is an active mixer with 4 mono jack inputs and a mono jack output. It's available at Thomann for €27 or Amazon UK for £26 (and also under the brand name Ammoon). Though cheaper than the LH-010, it's also larger. 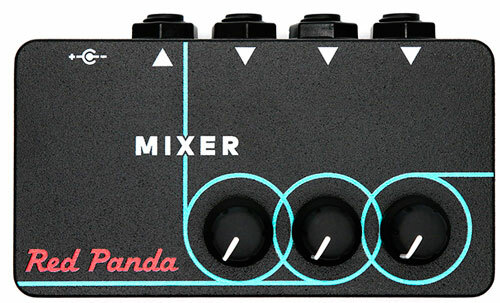 The Red Panda Mixer caters to guitarists with an active design that works off standard foot pedal DC adapters. The high-impedance inputs take guitar signals directly. You get 3 mono jack inputs (with pots) and a single mono jack out. The price at Thomann is the highest in this round-up, at €174. This can't really be justified. ART (Applied Research Technology) has been making channel strips, amps, DIs, crossovers, and other audio electronics since 1984. I believe they are a division of Canadian firm Yorkville Sound. 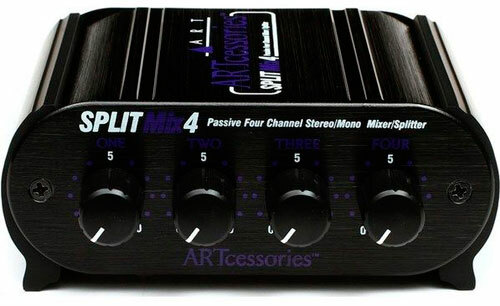 The ARTcessories Split Mix 4 is a passive mixer that, uniquely, can act as different combinations of mixer or splitter, depending on which sockets are used. There are four stereo jack inputs and one stereo jack output. The price at Thomann is €61. It's very bulky, but is the only unit here to use stereo jacks. It appears designed for keyboard players. The units listed above are suitable for instruments using full-sized mono jacks, but what of our Korg Volcas, Pocket Operators, mobile phones, and tablets? All of these use the minijack, for which there are only a few solutions. Let's check them out. The Czech company Bastl is certainly unusual, their products as diverse as coffee, clothing, and electronics. 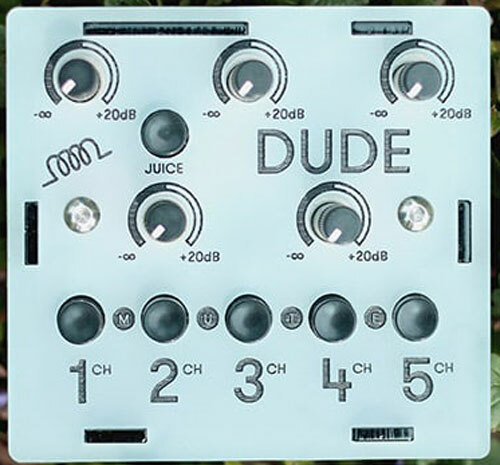 They've recently released the Bastl Dude, which was exciting at first glance. It's an active mixer providing 20dB gain. You get five mono minijack inputs, each with a pot and mute button. The position of these is far from logical, especially since a power button (labeled JUICE) has been positioned in the middle of the front panel. I am not sure who thought this was a good idea. Maybe the dude who grinds the coffee. The unit has a single stereo minijack out. Besides DC power supply, the Dude can run on four AA batteries. Direct price including VAT is about €92. Dimensions are not available, but it appears rather chunky for its slim feature set. The Achilles heel is the fact it has mono rather than stereo inputs. This renders it inappropriate for many of the desktop music units it appears to target. How curious! Rolls Corporation is an established firm that's been operating out of Utah since 1989. They make signal processors, amplifiers, mixers, etc. in a variety of configurations. Some of these are out of production, and many are similar enough that their product range can be confusing. 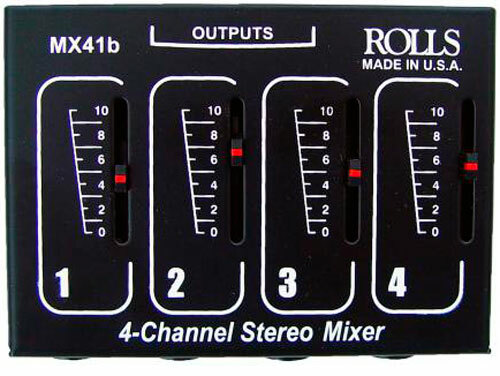 The Rolls MX41b is a passive mixer with four stereo inputs provided through both jack or minijack. This unique feature reduces the need for cable adaptors. The inputs have linear fader in place of the more common rotary potentiometers. The single stereo output is also available on both jack and minijack. Despite this flexibility, the Rolls is the smallest unit so far described. Thomann price is €88. Maker Hart appears to be a Taiwanese company. 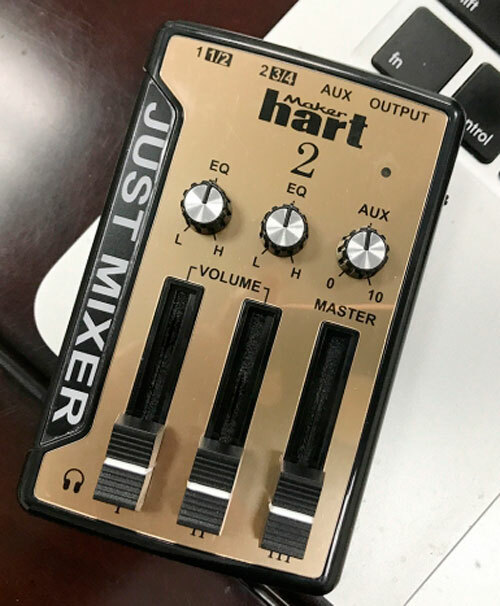 Their Just Mixer 2 looks like a toy, but actually has the best feature set in this round-up. You get 3 stereo minijack inputs. Two have 30mm faders providing 45dB gain, plus an EQ pot. The third is the auxiliary input, with 20dB gain on a pot (and no EQ). There is one stereo minijack output with a master fader and another for headphones. This tiny unit is powered by USB and, in a rather amazing twist, is also a digital audio interface to your computer. Amazon price is £50 for either silver or gold plastic. Note carefully that the initial version, simply called Just Mixer (no "2") was different in many ways. It had a balance control instead of the EQ, shorter 20mm faders, and only 20 dB of amplification. It had no headphone out and was not a USB interface. On the up-side, it could run from two AAA batteries. With many of the other units being constructed from solid metal by reliable companies, it is difficult to trust a plastic gizmo that appears to offer so much for so little. From their base in Amsterdam, Retrokits releases innovative hardware hacks. They are famous for their MIDI cable that contains a microprocessor for on-the-fly control information mangling. This magically provides velocity sensitivity for the Volca FM, chromatic sample playback for the Volca Sample, etc. Their RK-003 is a DIY kit for an extremely simple passive mixer, containing nothing more than 8 stereo minijack inputs and one stereo minijack out. There are no pots, the idea being that you control the output level on the instrument itself. You get no enclosure either, though they provide plans so you can grow your own. You can also buy front panels. It's as tiny as possible and costs between €29 and €63 direct, depending on how much work you want done for you. If you don't mind sourcing parts yourself, there's no reason you can't simply link up a few minijack sockets with resistors and create your own interface. Several guides are available on the web. Whether this is preferable to the Retrokits or not is an open question. 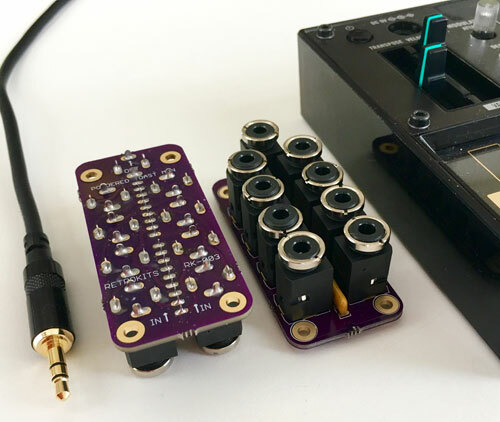 Patchblocks is an innovative system of interconnected, programmable synthesiser modules that was designed as a PhD project at Queen's University Belfast. In 2013 it was funded on Kickstarter and is now produced in Germany by Mindflood. The PBMIX3 is an active mixer designed specifically to be used with small desktop components, and as such uses stereo minijack connections. Three inputs each have a level pot. Two of these are at line level, with +/-12dB gain. The third is at instrument level with twice the gain. Each channel also has a switch to turn on the Aux send. These are summed and controlled with a master pot. The return acts as a fourth stereo input but has no level control. The master stereo output has a level pot. The unit is unique in having an internal battery, charged over a USB C connection. Apparently it is good for 8 hours. The construction is aluminium unibody with metal knobs. The side panels are illuminated with internal LEDs. Price is £130. CatManDeux has a video review, which allows us to see the unit properly. 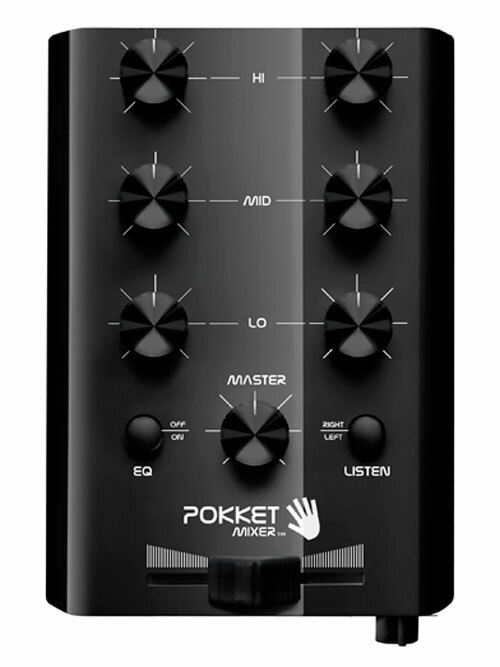 The Pokket Mixer is the only device in this list designed specifically for DJs. It's included for completeness. Released back in 2011, the current model of this passive mixer sells for €75. The cross-fader mixes between two stereo minijack inputs, each of which have a 3-band EQ with off button. There's a "listen" button for cue functionality, though this is unconventional, merely switching between the two inputs. Master and headphone outputs each have level pots (the latter on the front panel). 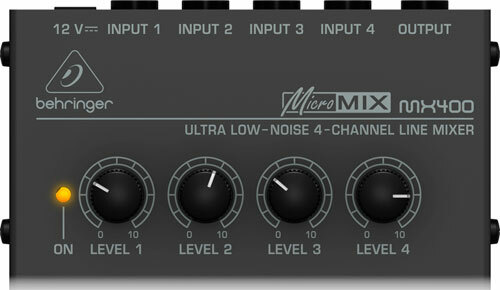 Also available is POKKETMIXER Volume PLUS with 10dB louder output. It's not immediately clear to why there are two models. Both are passive, so the additional volume can only be achieved through a transformer. My guess is that this unit is noisier, and so both are offered as a choice. Here's a handy table summarising these twelve mixers. I've converted all the prices to Euro to aid comparison. This research is part of a larger project funded by an Arts Council bursary. Gaz and Nick from SonicState call for a minijack mixer here in this video. They show the Rolls listed above.